This Unique spacious corner penthouse, #310 at Makani Sands, is the largest condo in the building! 3 Bedroom, 3 1/2 Bath on the 3rd & 4th floor has incredible views of the ocean and neighboring islands of Molokai & Lanai, with quick access to our beach & large fresh water pool. Decorated in a modern style, this beautiful townhouse comes equipped with a HDTV in the living room, and a TV in each upstairs bedroom. There is a full kitchen with all the necessary appliances. A large dining area with a dinner table. There is a 1/2 bathroom off the hallway downstairs. Spend some nights at home cooking up fresh fish on our beachfront BBQ, and have dinner on the large glass table. 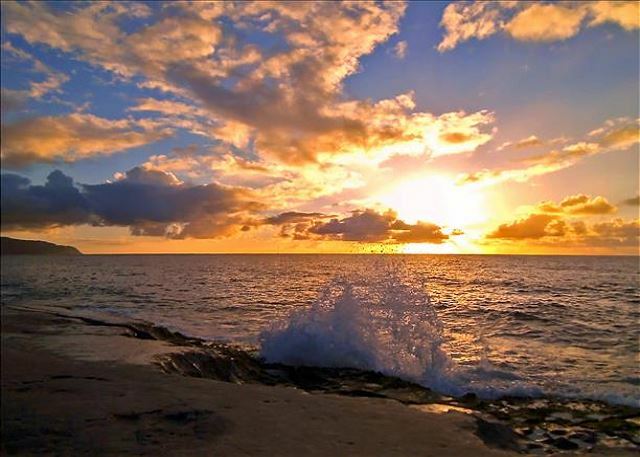 Two large ocean side lanais perfect for fabulous sunsets and whale watching. Upstairs oceanfront large master bedroom suite has a king bed, & master bath has a Jacuzzi tub for your relaxation and a double sink & dressing area. Guest bedroom on the mountain side, has a king bed and walk-in shower. There is a downstairs bedroom with twin beds, and a private bathroom. There is also a sofa bed in the living room for extra guests! Come and experience West Maui with spectacular Makani Sands #310 your home away from home while on Maui! Sun and fun - 4 adults - (1 couple, 2 singles) - 3 bedrooms, each with own bah was were perfect for us. Early morning coffee on the lanai and gorgeous sunsets. Whales and turtles too. Great location for accessing beach & watching whales & sunsets. Marie & Roseanne in the office we’re very helpful and responsive. Very quiet at night for sleeping & grounds & bbqs well-maintained. The unit needs new bed pillows and bed linens, fridge is on its last legs (noisy at night) & upholstery on chairs & couch needs cleaning. Location is very convenient to shops and attractions. Sun shades torn & need replacing. I stayed in this unit for two weeks with my mom, aunt, and two friends of ours. It was just as pictured. Marie in the front office was also very friendly when we asked for suggestions of activities and restaurants to try during our stay. Rainbows almost every morning, Turtles every day, swimming with them and watching them from the condo and swimming with them. Beautiful sunsets, Farmers market just a short walk away. Snorkeling right outside your door! Very nice. Great location, Lots of whales this year. Hope the beach returns. We loved our stay at the 3br penthouse. Amazing location on the ocean. Waves were so loud we had to close our screen door! Furniture and decor a little dated but overall experience was great. Kitchen fully stocked and free parking is nice too! Beautiful unit # 310. Spacious great location just outside the tourist areas. Great views and accommodations. What a great spot on the Kanapali coast of Maui. North of Lahaina Town and DIRECTLY on the beach. The unit (310) was spacious and comfortable. It had everything we needed, fully stocked kitchen, beach chairs, snorkel and mask, and beach towels. The rooms and beds were comfortable and clean. Towards the end of our trip the central AC stopped working. The management staff was great, offered us the choice to move to another unit or take a discounted rate and stay put. They also had a bag of beach/sand toys we could borrow for the kids to play with which was great and saved us the trouble of buying and abandoning another set. The building has a pool, elevator, and parking. The beach is the perfect sandy beach, great for kids (mine are 3 and 5) , and frequented by sea turtles. It was a pleasure having you and your family stay with us at Makani Sands. Hope you're able to come back someday and stay with us again. it was a awesome vacation perfect location and condo for our needs will come back next year for sure. loved it. was amazing and soo helpful! From the second we walked into the unit and saw the awesome views from the living room we knew we made the right decision. The view from the master bedroom upstairs is the same as it the view from the living area. There was a nice lanai that allowed us to sit outside in the shade and enjoy the views and sounds of the ocean. The unit was clean and other than a few sugar ants, bug free. We had an issue with the bed in the down stairs bedroom. It is a trundle bed that rolls out and up to make a king size bed. A pin that holds the bed in the upright position broke and the bed would not stay in the upright position. I told management and they attempted to fix the bed but were unable to. The bed was still usable in the lower position but it was now two single beds instead of a king size bed. This is an older unit but it is in good condition. The unit has AC but there are also these louvered windows in the unit that allow the air to escape in time. The weather was very cool at night so it wasn't a big deal but if you are looking for a completely contained, weather sealed unit then this may not be for you. The staff at the condos were very nice and helpful and the maintenance man (Bert) made sure that we had everything that we needed to enjoy our stay. We would definitely stay on Makani Sands again if we ever were to return to Maui. Unit was in poor condition. Fridge leaked all over kitchen constantly. Guest bath water was shut off for 2 days due to leaky faucet. Garbage disposal broke. Living room door is constantly off track. Shower door in master is broken. Unit had constant cockroaches. Furniture is very dated. We have stayed in this unit for the past 5 years and we will not be returning. Location location location – this one has it! 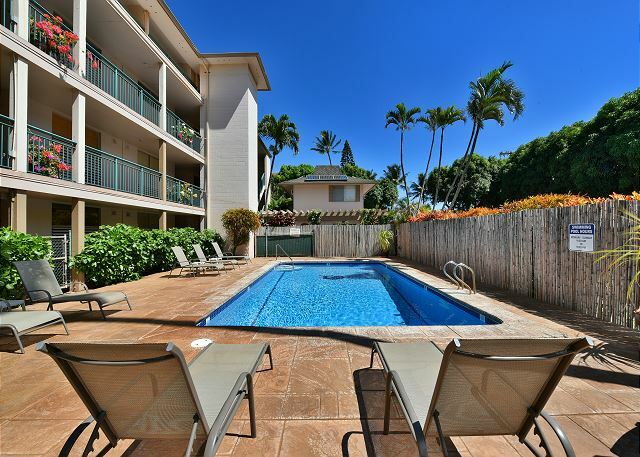 Wonderful beach front condo on the two top floors of the Makani Sands condo. PROs: very spacious, perfect location at a small beach, gorgeous views, big turtles swim near and come up onto the beach, two lanais with chairs, close to farmer’s market, tons of amenities, responsive friendly staff, loud surf, pool. CONs: interior is dated, needs some updates and maintenance. We *LOVED* it here! Yeah, it’s rather dated but it’s large and the location with tons of turtles (multiples came up onto the small beach) and the farmer’s market is perfect! We also enjoyed the two big lanais/balconies and the crowd there was a bit older and nice and quiet. If you want downtown party vibe – this one isn’t it, but if you want to relax in the sun, enjoy the water and swim with the turtles then this one is perfect! Coffee stands and restaurants are a short walk away (Java Jazz is very eclectic), so is the Honokawai Beach Park. The surf is surprisingly loud and we loved it! Washer and dryer worked well. We were a party of six, four adults and two kids age 3 and 5. This unit met our needs very well. We would stay here again. The unit is right on the water with terrific views of the water and Molokai. The sounds of the surf were a treat. Some of us spent many hours lounging on the upper lanai. The unit is nicely furnished with everything one would need. Some of the fixtures and appliances are a little older and comfortably worn while still being nicely maintained. The onsite staff were friendly and helpful. The private beach was a little small and the surf a little rough four our young kids, but there is a terrific beach for kids about a 10 minute walk to the south. We also enjoyed the "Badass Coffee" shop across from this beach park as others mentioned. The location was otherwise terrific. It was a great experience, right from the very beginning. Marie was accommodating in helping with our booking, to the friendly, family-like atmosphere of Makani Sands. An Excellent experience. The location was a hop, skip, and a jump to everything. My son and I made a morning ritual of walking on the beach in the morning (seeing beautiful fish along the way)to the "Badass Coffee joint" down the street. Even though there was a coffee maker in the unit, it was a lot more fun taking the walk and spend $1.98. The views from our balcony were beyond description. 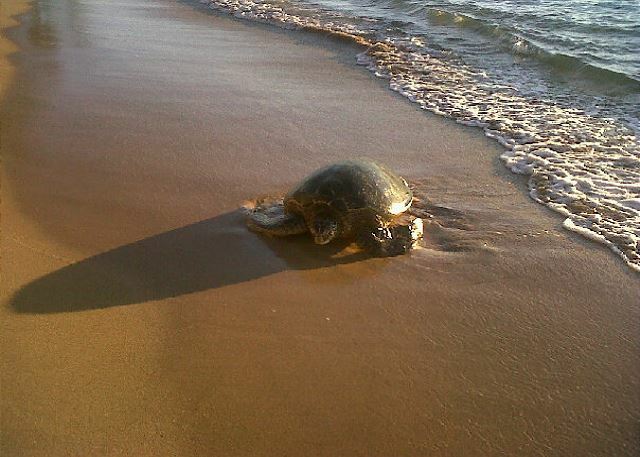 Turtles constantly roaming on "our beach". I even saw a stingray cruise thru on occasion. I kind of looked like a stealth bomber snorkeling. Although there wasn't much to see snorkeling on our beach, there was just enough wave activity to keep us body surfing. The sound of the waves was very relaxing. We especially missed it our first day back home when all I heard were lawn mowers from the local gardeners. The room was beyond description. Everything you could possibly need. The staff was great (and friendly too). We are already looking into returning next year as soon as we get our calendar settled. The property is meticulously maintained. The only negative is that our bathroom did not have a lock on it. Absolutely fantastic location, great value. Easy to book, prompt friendly service, everything exactly as expected with wonderful views of the ocean and great snorkeling right off the back porch. Robert S from Reno, NV does not recommend this vacation rental. Great location, right on the water, however the presence of large cockroaches was a very negative factor. Would not stay here again unless management addresses the problem. When reported to manager on duty was given unconcerned "one up" comment that they had not only cockroaches, but mice too in the office. Otherwise clean but dated property. Wonderful place in a terrific location. Has its own beach. Clean, quiet with gorgeous views. Near services and access to other beaches. We've been visiting Maui for five years running, and the Makani Sands is our choice of lodging every time. If you want to stay away from the overpriced, sterile and oversized mega-properties, the Makani is the sort of place that can't be beat. It's a little older and comfortably worn while still being nicely maintained. It feels like home in Paradise. I can't imagine staying anywhere else. Location is as close to the water as you can get. That being said, bring good earplugs!! My husband complained that the ocean was so loud he could not sleep! LOL. I was worried about bugs, but only encountere 1 very dead roach in the half bath the whole time we were there, which I was able to dispose of before my girls saw it! :) The male manager is very friendly, as are the residential owners. The cleaning fee is a little steep, especially since none of it is refundable. All in all though, it's a great place and my family loved seeing all the turtles. This condo had a very nice beach, protected, shallow, not too many rocks. This unit however is in need of updating. appliances, cabinets, furniture, carpet are all old. One of the burners on the oven did not work. The refrigerator was not cold enough and instructions were to not reduce the temp. same with the AC unit, which was needed. Great condo big clean modern. Loved seeing the less tourist feel. Turtles, Whales all viewed from master bedroom deck and living area deck. The views of the ocean and neighboring islands is outstanding from this unit. Gorgeous sunsets every evening. 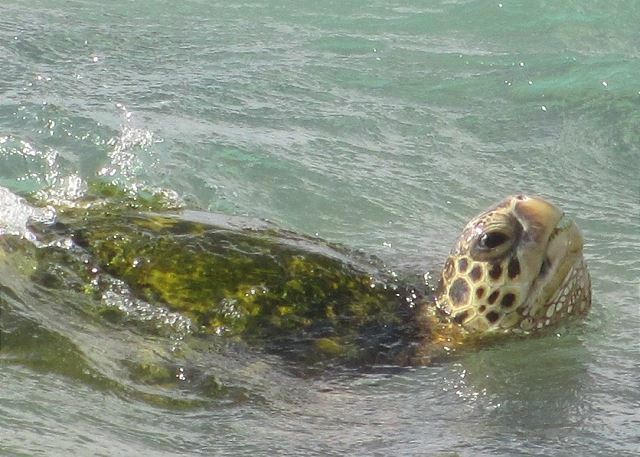 Green sea turtles swimming up and down the beach several times a day and sometimes up on the beach! Makani Sands is a convenient walk to some markets and restaurants nearby and a good middle ground for visiting other beaches up and down the west of Maui. This unit has A/C which was a blessing as we were there during record breaking heat in June/July. The temp in the condo without the A/C was in the mid 80's and we were required not to set the A/C below 78. The unit is spacious and well laid out but needs some repairs and a fresh coat of paint in several areas. We would come back here again. Had a pleasant stay in the unit. The floor plan is amazing, but the unit could use a major facelift especially the kitchen. Master bedroom/bath has a great floor plan but things are just old and don't work. The second bedroom upstairs is in the same boat, nice room just old and outdated. 3rd bedroom off the kitchen has a newer feeling bathroom, but the trundle bed thing is just weird. Overall the unit is what we payed for, just seems like it hasn't had any work done since the late 80's. The lanais were great for watching the turtles, and the BBQs on the deck worked well. We have been coming to the Makani sands for several years. We like the size of the unit, as well as the number of other people that can stay here. We love to sit on the lanai and watch the whales and turtles, the small beach is nice for swimming in the ocean and the pool in front is nice as well. You can't beat the proximity to the beach. Your back wall on both floors is a huge patio door which has a million dollar view! The waves were somewhat aggressive our entire week so the sound of the surf is ever present. (If you are a light sleeper this may be a problem - but it's a pretty incredible problem to have ??) You get beautiful sunsets every night. You can swim and snorkel right at this beach although not the best snorkelling compared to other parts of the island. We played in the waves while watching the sunset one evening - Memorable!! The unit is large and spacious and sufficiently stocked. Many updates are done but a little worn, or could use more attention to detailed cleaning around the edges. The phone was out of order in our unit and never did get fixed while we were there however the TV in the master bedroom didn't work and they did fix that quickly. We will definitely return here as even the expensive hotel chains do not have this beachside proximity. Great value for an expensive island. Great classic 70's decor. Loved the location, the amenities, the staff. Everything was good! Makani Sands treated us like 'family'. Bert, the property manager was terrific beyond words!! The facility was delightful, as always, and the location was just far enough from the crowded beaches we had peace and beauty and beach fun. The turtles every afternoon at sunset were a blessing. This 'home away from home' is the perfect spot for families. Thank you Rosanna, Bert and all!! Good location, large open floor plan, and wonderful view. Beautiful location and views and sunsets. All in all, we enjoyed our second visit to Makani Sands. The location and views cannot be beat. We were in the same unit 310. It was generally very comfortable, but is starting to show a little aging and could use a little refreshing. Again, we were very happy with the easy beach access and the pool was another great spot to relax. The garden and planting were all lovely and very well maintained. There was some construction going on during the weekdays and, at times, was a little disruptive. Luckily, our unit was located a good distance from the work so the noise was not too bad. On Thursday we were looking forward to staying at the beach out front and, unfortunately, were asked to move off the beach (the morning is the only time the tide does not eliminate the beach area) as there was major drilling work being done on the wall of the adjoining condo. Obviously, this work is probably a one time occurrence, too bad it had to be the week we were there. Other than that, we were very happy with our stay and hope to return one day. We will just check to make sure there is no maintenance going on when we come the next time. Had a great time in Unit 310 at Makani Sands. Condo is very spacious and has all the amenities that most people would need. Awesome views of the ocean off of it's 2 balconies. Highly recommended. The condo was nice but you could tell it is needing some repairs. In bedrooms the closets were rusting and did not function well. The drawers in the master bedroom were in bad shape. The overall experience and the view and location was very good and we enjoyed our stay! Loved the sea turtles being so close.